With the win, the Chiefs finished 9-7 and swept the Chargers for the first time since 2003. Despite the win, the Ravens won over the Browns eliminating them from postseason contention. ↑ "Kansas City Chiefs Fans Reclaim Guinness World Record for Crowd Noise". ABCNews. ↑ "Reports: Chiefs WR Dwayne Bowe to be Suspended One Game". CBSSports.com. ↑ "Chiefs OT Donald Stephenson suspended four games". NFL.com. ↑ Rosenthal, Gregg (November 24, 2014). "Eric Berry's season over; will visit lymphoma specialist". National Football League. ↑ "Chiefs Family Rallies Behind Eric Berry". KCChiefs.com. ↑ "Cardinals Show Support for Eric Berry". KCChiefs.com. ↑ "Statement from Chiefs Safety Eric Berry". 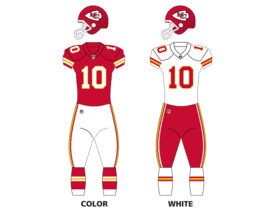 KCChiefs.com.